We shop online for so many things these days with online sellers offering so many discounts, free shipping, etc. ShanKrila even has it’s own Amazon store where I regularly add the stuff I like and recommend. Let me know if you have suggestions for me to add to the store. But, with so many online purchases you might make every week how do you keep track of your receipts? MyThings offers to help in this area. MyThings is a free web service that lets you track the purchase and organize receipts so you can easily create a list of products you own. From the MyThings community you can get and share tips for the products you buy. There is also an active forum if you have questions on anything related to the site. If you collect antiques, art pieces, etc, you can also get valuation for your things. You can also add your things manually and add all details, images and even attach documents to your thing. When you view a thing you own, you get tips for it, manuals and repair info and other deals related to it in neatly organized tabs. You can even sell your things on eBay! I have organized my online receipts in a couple of ways. I also usually print a PDF copy of the receipt and store it in a Dropbox folder so I can access it anywhere. MyThings do offer an unique interface where you can store much more details about the products we own like the serial number, special marks, attach documents, images, etc. Since we own a home, we have so many things to take care of and so many manuals lying around it is sometimes an impossible task to find the details we are looking for. I can see MyThings being a great repository of all this information that I can access quickly in addition to saving my receipts in one place in an organized fashion. I did send an online receipt to the email address 5 minutes after I signed up. But, I don’t see it yet in my account so I can’t expand more on how it handles receipts yet. 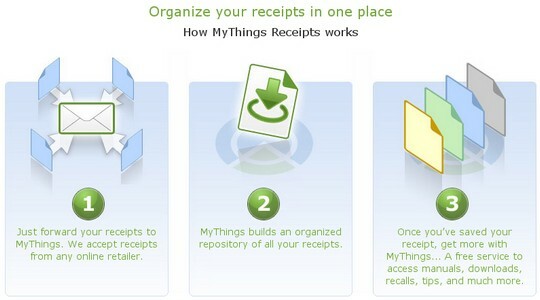 But, it’ll be great if MyThings could expand its receipts handling to scanned receipts for items purchased in-store. Evernote can read scanned receipts and make it searchable and something like that will make this service even more valuable. But, for now I’ll be content with the ability to upload a scanned document. Plus, the security aspect of the site is also pretty good and you can read about it in their About us section. I would however like to see more ways to view my own collection of things and may be even tags to locate things quickly. Would you trust and use a service such as MyThings? What other features would you like to see in there? MyThings looks very usefulm i ll check it out and try it its an program i already looked for, thanks. Cool. Thanx a lot for the info. MyThings looks useful, got some intersting functions for what i should tryout MyThing, thanks for sharing the informations with us. MyThings looks useful for the things i do , i should try it. thanks for recommadtion this site. K, I absolutely LOVE the new design! You outdid yourself. Another similar service is Shoeboxed.com Mail in Service. It’s sort of having a personal assistant to do your laborious work of organizing receipts for you so you can do more important things.